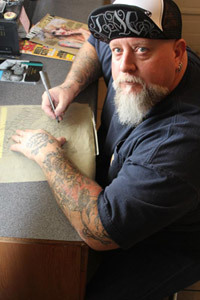 Brent "Taggurr" Roman has provided quality tattoo art for the past Eighteen years. Proficient in a wide range of Art Mediums from pencil sketches to airbrush painting, he has found his Mastery in the Art of Tattooing. A self trained artist, Taggurr's influences range from Italian Renaissance Artist Michelangelo to biker lifestyle artist David Mann, to many well known tattoo Masters of today such as Jack Rudy, Tony Olivas, Bob Tyrell, and Guy Aitchison. Taggurr specializes in black and grey, portraits, and cover-ups. Taggurr is not limited to these styles alone and can provide a wide range of services to meet any customer's needs. Major League Baseball player and San Francisco Giant's Pitcher Sergio Romo paid a visit to Brent "Taggurr" Roman's shop to get some work done during the holidays. Deviant Depiction was able to sit down with them for a little Q & A. Here is part one.